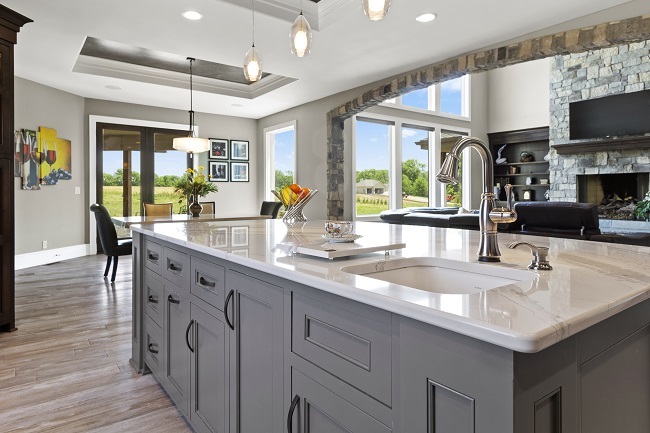 Choosing the right countertops makes all the difference when it comes to kitchen design. Beautiful countertops that are properly cut and fitted will enhance the look of your kitchen or bathroom and increase the value of your home. Following are the four main steps involved in stone fabrication, the process of cutting and designing stone products for interior design usage. First, you’ll have to choose the kind of stone you want to use. This will depend on the design of your kitchen and the style you are looking for. Different kinds of stone have different templates and designs. Many of these characteristics are natural and are unique to the material you are using. If you don’t like certain characteristics, the fabricator may be able to remove them for you and still use the material of your choice. Next, the fabricator will have to take measurements of the space you want to install the stone in. For example, there may be a sink installed on your countertop that you need to leave room for. The fabricator will then go ahead and cut the material into smaller pieces that are easier to work with. The next step is carefully cutting the stone slabs into the measurements that were taken earlier. This must be done with special tools. Extra caution must be taken to ensure that the measurements are exact. Once the stones are cut into the exact measurements needed, the fabricator will move on to the final part of creating the stone. This involves polishing the stone so that its surface and edges are smooth. A seal to protect it from liquid spills may be applied. If necessary, the fabricator may strengthen certain areas of the stone. Finally, the stone will be installed. To get in touch with a professional stone fabricator for your countertops, contact us today.